Drums and vocals are often the most prominent parts of a recording, so it’s crucial to record these well. Poorly reproduced drums will be obvious to even a casual listener and distract from the vocals. 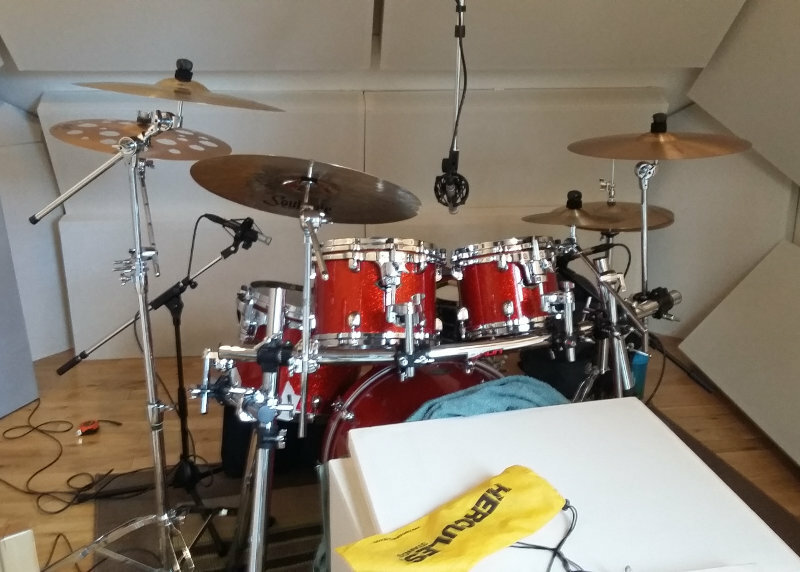 In a previous post I explored the sounds and musical consequences of some different drum overhead mic placements such as XY, ORTF and spaced pair. We concluded that ORTF offered the most exciting image of the whole kit in a practical way. XY was useful, but a little static. Spaced pair was unpredictable, not a great idea when there is time pressure in a session, especially if the final arrangement of the music has not been decided. On recordings since then I found that a stereo width similar to ORTF is possible by increasing the angle between and pair XY. However, with XY and ORTF, the toms always seemed lower in volume and less full than the cymbals, not ideal except perhaps for jazz or other genres with an emphasis on the top of kit. Close mics on the toms added oomph, but if the tom and cymbal balance was correct in overheads in the first place they wouldn’t be needed. On the RecPit Forums William Wittman described an approach that will do this. He used it on several excellent sounding recordings. He places one mic in front of the kit above the rack toms, pointing toward the snare, and another coming in from the floor tom side, pointing at the snare and hi hat. So it’s not overhead as such, but can be used in a similar way. For someone used to pointing mics instinctively at the left and right sides of a kit it seemed a bit odd at first, but it isn’t: the left mic predominantly covers the floor tom and cymbals to the left of the kit, the centre mic the rack toms and right hand cymbals. When the recorded tracks are panned fully left and right, a tom roll presents the expected panorama. I was very keen to try this, as was Drummer Christopher Scott who was in my studio last week. Both mics should represent the kick and snare drums as equally as possible so they remain relatively central in the stereo image. In reality this is not possible while retaining a similar distance from both mics to their predominant toms. I started by getting a good sound on the centre mic, then placed the left one so the kick was in the centre (both mics a similar distance from the kick beater). The snare was then off centre, so I moved the left mic until a good compromise was achieved. This is a spaced pair setup, it’s crucial to be aware of any potential phase related problems between the mics. The toms are really well represented, the cymbals are clear, and the wide stereo image is dynamic and exciting. For sure I will be recording drums this way again!